Grandpa, where do you keep your wallet? Brazilian President Dilma Rousseff, she for whom everything is “an internal affair” unless it involves left-wing Latin presidents, is calling for an emergency meeting of UNASUR next week here in my adopted hometown of Santiago. As we all know, Foreign Minister Elías Jaua went on a whirlwhind tour of South America last week, desperate to prevent the OAS from discussing Venezuela, and instead proposing it go to a friendlier forum such as Unasur. It seems like that is going to happen a few kilometers from where I am writing this. We can expect a wholehearted endorsement of the Maduro administration from UNASUR, as well as a denunciation of a “soft coup” and of “fascists” trying to overthrow him. It won’t matter one bit, since people will remain on the streets. The interesting thing, though, is that Brazilian construction firm Odebrecht, the Gerald Fords of construction firms, are owed more than $2 billion from the Venezuelan government. Should I connect the dots for you? 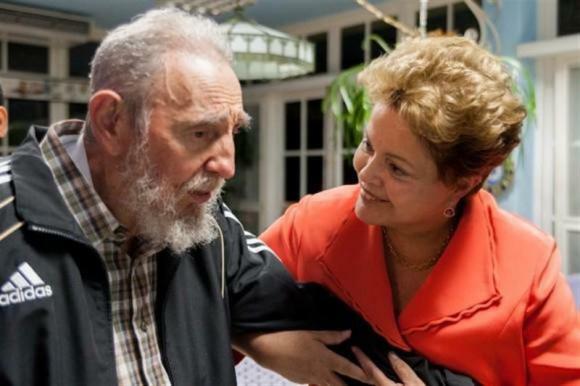 Dilma + UNASUR + $2 billion = Love for Maduro. Odebrecht has become the nuts and bolts of the Brazilian operation in Venezuela. With $20 billion in investment projects in the country, and 13,000 employees in Venezuela alone, this firm is so deeply entrenched in the survival of the Maduro administration, that it becomes the Brazilian Foreign Ministry’s only concern in Venezuela, just like its diplomacy toward Cuba is guided by the same goals. And if Maduro continues to destroy PDVSA, a competitor of Petrobras, then that’s just the cherry on top.